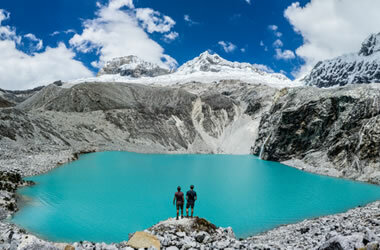 Lake 69 is the most beautiful lake in the Cordillera Blanca and become popular by its easy reach in just a one day hike. We offer one day hiking services including a hiking guide and a transfer from Huaraz with daily departures. 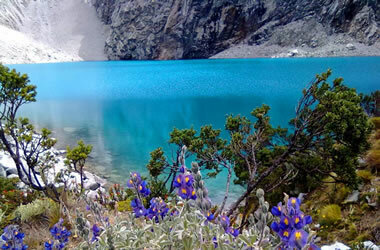 Hiking the 69 lake from the trail, you will enjoy the wonderful mountain views of Pisco 5752masl Chacraraju 6112masl, Yanapacha 5460masl, and Huascaran 6678masl northern and southern peaks. Itinerary: Early morning breakfast is at your hotel in Huaraz, then our private bus will pick you up and drive to the start of the hike at Cebollapampa. It will take three hours approximately. You then begin on a moderate slope for about 4 hours before you reach lake 69. When you get to lake 69 you will have enough time to discover its beauty making for many unforgettable pictures. You can walk around the lake and take it all in. After a couple of hours you will come back the same trail at Cebollapampa where our bus will be waiting for you. Board the bus and return to Huaraz, arriving at around 6pm.